Enter the parameters for your capacitor model and this page creates a SPICE model for you. L1 = 1/( (2*pi*fo)^2 * C1) Series Inductance. 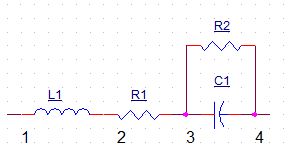 Try out your SPICE model in circuit using the capacitor model. How do you get the SPICE subcircuit into the text box? Two steps make this possible. First, create the entire text by individually adding each line of the subcircuit to the variable "TextOut" using the "+=" operator. Second, when your text is complete, write TextOut into the text box named "myTextArea" as shown in the last line. TextOut += "****************************************" + "\n"
TextOut += "*  Capacitor SPICE Model\n"
TextOut += "*  Subckt Name: " + SubName + "\n"
TextOut +=  "*" + "\n"
TextOut += ".SUBCKT " + SubName+ "     1   4" + "\n"
TextOut += "*   fo=" + fo + " Hz\n"
TextOut += "L1    1     2     " + L1 + "\n"
TextOut += "R1    2     3     " + R1 + "\n"
TextOut += "C1    3     4     " + C1 + "\n"
TextOut += "R2    3     4     " + R2 + "\n"
The text box was already used in a topic coverting the RC Filter Response vs.Time. Heres the "textarea".tag naming the area andf specifying the Rows and Cols.